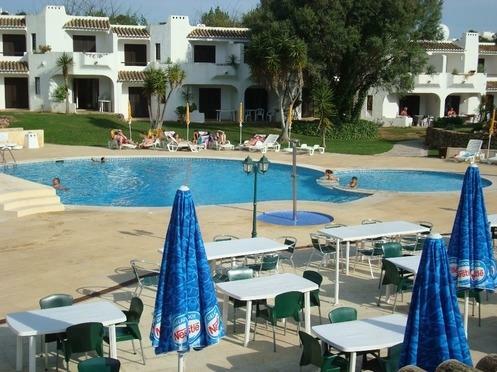 South facing poolside 2 bed apartment Club Albufeira - Property for sale. Full Description: Fantastic opportunity! This 2 bed, 2 bath fully furnished and equipped ground floor bungalow style apartment is located on the very popular complex of Club Albufeira. Located right behind reception and with a South facing terrace overlooking one of the pools this apartment has proved very popular with holiday makers, particularly those with mobility problems as there are no steps to negotiate and parking directly outside. Apartments here offer fantastic rental potential for those looking for a holiday with fabulous resort facilities including 4 communal swimming pools, snack bars, fine dining restaurant, supermarket with bakery, Crazy Golf, tennis courts, 24 hour year round reception where you can book all excursions, 24 hour security and surveillance cameras, cash point, internet facilities and a free shuttle bus that takes you to the beaches and shops. All this and only 5 minutes from the Old Town of Albufeira with its lovely sandy beaches, cobbled streets lined with various restaurants, cafes, bars and shops. Transfer time from faro is only 25 minutes thanks to the motorway link. Accommodation comprises an entrance hallway, fully fitted and equipped kitchen, lounge/dining room with fireplace and doors out to the South facing terrace with patio furniture and lovely views of the pool. There are 2 double bedrooms with fitted wardrobes, the master with en-suite shower room and another full bathroom and storage cupboard. The master bedroom also has doors to another sunny terrace. It's not often an apartment in this location comes up for sale on the complex and therefore offers very good investment potential and an opportunity to generate a healthy rental income. Viewing highly recommended.